It's really delighted to see that 3 other Sayadaws and lots of Dhamma friends come together to celebrate his birthday. The lunch table was filled with different dishes of Burmese food as our Devotees brought cooked food from their home to offer them Sayadaws. 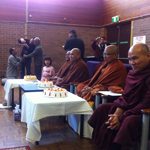 All Dhamma friends sang the birthday song for Sayadaw and he then cut the birthday cake. Sayadaw also gave Dhamma talks in the afternoon to practice meditation whenever there is time and to remember Buddha's talks while you are facing the danger. May all devotees and well-wishers rejoice and share in these merits accrued from this Dhamma-dana. May these merits of our doners be a good pre-condition for the attainment of Nibbana. May you and your family be blessed with peace and happiness always. The Panditarama Sydney Meditation Centre (PSMC) was established in 2000 by our Venerable Sayadaw U Panditabhivamsa of Panditarama Shwe Taungone Meditation Centre of Yangon to contribute the experience of Dhamma to meditators (yogis). It is one of the Buddhist meditation institutions in Sydney and it is open all year round. The main objectives are to enable both Asian and Western YOGIS to practise meditation and spread the Buddha Sasana or dispensation in Australia. 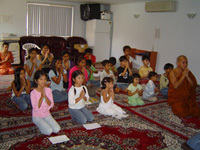 To nurture and raise a new generation for Sasana, Sayadaw U Pannathami is conducting the Buddhist Cultural Training Course every Sunday from 6th August 2006 and it is a great chance for adults and children. It is definitely free of charge and why thinking? Send your children to Sunday School. We have brought Buddha Image which is approximately 7-feet and 9-inches in height from Yangon, Myanmar in early 2007 and now it is being placed at Dhamma Hall at new centre.